The most difficult sell for new parents in the school when I was a Waldorf teacher was the strong recommendation that TV be eliminated. TV’s become such an unquestioned fixture in all of our homes that we hardly know how to live without it. And children are so much more susceptible to its seductive lure. At a conference for parents considering Waldorf education for their children, one of the dads questioned a presenter about the TV ban. She asked him if he would consider giving his child a glass or even a sip of alcohol. His shocked reply was, “Of course not!” To which she replied that TV was a drug, just as harmful as any other. It’s since been documented in books like Marie Winn’s “The Plug-In Drug” that this is indeed the case. (Look for the 25th anniversary edition in which she includes other forms of media that have since joined TV). Aside from physiological effects like radiation exposure or an unhealthy sedentariness, there are informal studies that suggest there may be a connection between too much TV and ADHD. “LimiTV” cites research from the 1970’s (Halperin and Dumont) that suggests that the rapid changes of sounds and images on TV may overwhelm the neurological system of a young child, causing attention problems that show up at a later date, by stimulating a child to mimic that dynamic behavior. In other words, what we call ADHD may simply be the child subconsciously copying the frenetic pace of TV programs. Similarly, in 2004, Dr. Dimitri Christakis and colleagues reported in the Journal of Pediatrics that early TV viewing (ages 1 and 3 were studied) is associated with attentional problems at a later age. “LimiTV also says that the early years are crucial for healthy brain development, that the brain is most plastic at this age when its “wiring” or making essential connections between billions of neurons occurs. A young brain can be “wired” to respond more to the TV environment than to the real world. One of the saddest effects of too much TV is the loss of manual dexterity and eye-hand coordination, and a general lack of motivation toward any sort of physical activity. Before the advent of TV, children were a lot more active. Outdoor play was by far the preferred choice for after school, the weekend, or summer vacation, and children were expected to help with household or farm chores, thereby learning life skills while engaging in healthy activity. It’s been shown that working with the hands is directly related to healthy brain development, and knitting is a wonderful example of using both hands in a way that stimulates an enhanced physical connection between the right and left halves of the brain. 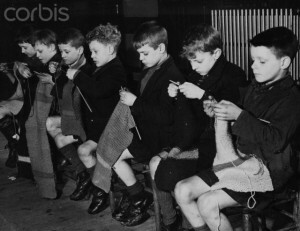 These English schoolboys were quite engrossed in their knitting, as are Waldorf students who learn to knit in 1st grade. 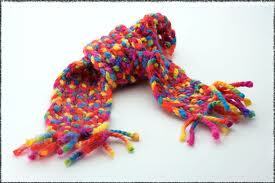 Greg White, from Washington state, started a twice-weekly lunchtime knitting group for 4th to 6th graders. Greg is a surveyor for a local firm, and fights a never-ending battle, through knitting, for kids’ learning skills, self-confidence, and social interaction. Greg’s skills with wool and yarn are many: shearing wool, spinning yarn, decoding patterns, all in all making lunchtime nicer with needles and yarn. Having a tangible result of time spent is another plus. 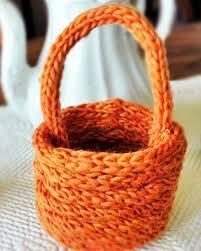 Children gain immense self esteem from creating a useful object, for self or others. Look at these examples of what any child can create and ask yourself if this might be a more worthwhile. enjoyable, and altogether happier activity than watching TV!